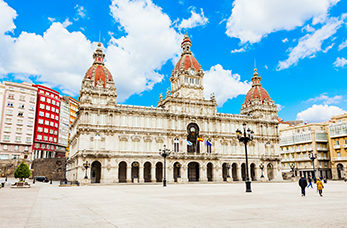 La Coruna is a city that is surrounded by the ocean and your gateway to Santiago de Compostela. The site of the supposed shrine of St. James the Apostle. Santiago de Compostela is one of the most important cities of Galicia, the city is dedicated to honouring St. James the Apostle who is reputed to be buried here. Built by the Romans, its the worlds oldest lighthouse which has been fully operational for nearly 2,000 years. Old town is a delightful stroll through Galician history with churches, shops, Galician writers mansion and Constitution Square located nearby. A neoclassical palace built in 1740 with the "desire fountain" in the centre it’s a real snap shot into the Coruna's life. Betanzos has one of the best preserved old quarters in Galicia and renowned for its local delicacies and regional wines. Offering scenic beauty and Europe’s finest porcelain this pottery is more than a factory or store its an artistic design centre. The burial place of St. James, is a stunning collection of statues, fountains and epic Cathedral making it one of the most jaw dropping destinations on Earth. A subterranean museum with a collection of tapestries and archaeological pieces.